Hey, is there any broccoli stuck in my braces? You might be asking yourself, "why wear fake braces?" Back in the 80's it might not have been cool to have a nerdy look, but these days, geek is the new chic so why not embrace it? These fake teeth with attached braces will definitely fool all. Just throw on a pair of thick glasses, a bow tie, and a tiny pocket calculator to add some nerdy style to your ensemble. 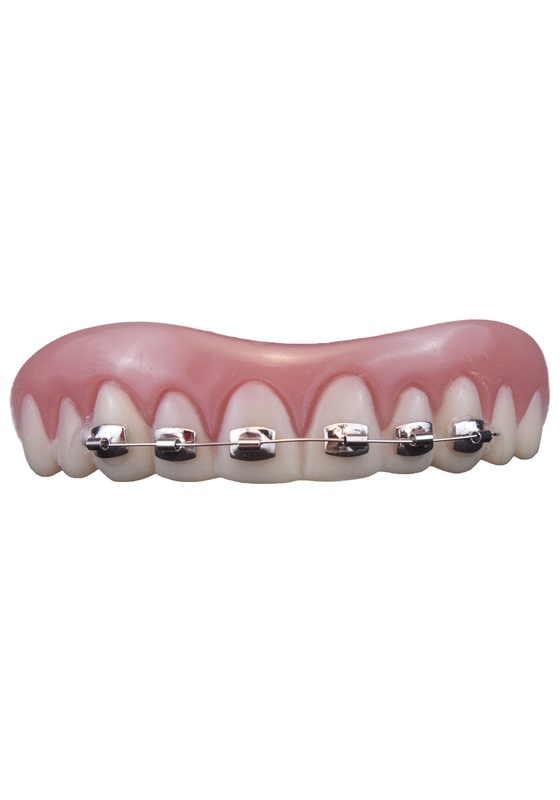 You don't have to worry about these fake teeth falling out and blowing your cover, because your teeth will come with a set of instructions and mouth adhesive. You may have a slight lisp while these bad boys are in, but hey, that will only up your geek factor so...you're welcome! The perfect accessory to add to any geek inspired costume or just throw them in whenever just to get a few laughs from your friends.